The words Monte Cristo means Mountain of Christ in Spanish. The Monte Cristo Gold mine has, from time to time, been referred to the Montecristo Gold Mine, Monte Christo Gold Mine and the most popular reference as the Monte Cristo Gold Mine. The first record of the discovery of gold reported in Los Angeles county was in 1834 From 1834 to 1838 the San Francisquito, Placerita Caceta and Santa Feliciana placers were worked by priests from the San Fernando and San Bueno Ventura missions. The placers of San Gabriel canyon were worked by priests and native Californians until 1848 when gold was discovered at Sutter's mill by Marshall. Reports of work on gold quartz veins in the Mount Gleason area indicate that the Monte Cristo mine was probably discovered very early. The history of the Famous Monte Cristo Gold Mine (See Map) lies well up on the chaparral-coated slopes of Roundtop Mountain(See legal description), around Mill Creek and Ootsark canyon. Many of the older tunnels and shafts are closed, and the 100 year old Mill Site machinery is no longer in operation. 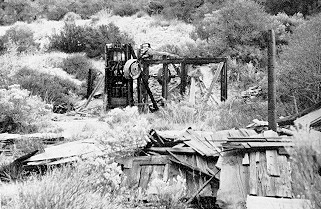 The Monte Cristo Gold Mine has not been in operating like in the old days, but over a half century ago it bustled with activity. No other mining venture in the San Gabriel Mountains or in the Los Angeles area was so famous and became steeped in legend, drama, and broken dreams. The owners of the Monte Cristo Gold Mine are Bob and Susana Kerstein. The property was acquired by their family in the early 1940's. They own 25.66 acres of private property in addition to the 525 acres of contiguous mining claims which surround the famous mining property. All of the mining claims have been registered and kept current with the Bureau of Land Management and/or the County Recorder's office for almost 100 years. There are property managers on duty on the property, who maintain the structures and the mining claims, as well as keeping trespassers and possible claim jumpers off the property. Barry Baker has been managing the property since 1991 on behalf of the owners. If and when gold reaches a high enough price, the famous mine could one day be up and operational again. Legend associates the Monte Cristo Gold Mine with the fabulous "Lost Padre" gold mine of mission days. Scholars question that such a mine existed, but the story has nevertheless persisted for over a century. The Pasadena Union on October 29, 1887 makes reference to the Lost Padre gold mine and its fabulous wealth. It is said that the Indians who manned the mine revolted against the padres and removed all traces of the mines existence. A new mining district north of the Tehungo ( probably referring to Tujunga)and east of the Soledad district has been formed. Gold bearing quartz of great richness has been discovered….Four large arrastres will be in operation in a few days. A water wheel 60 feet in diameter is being erected for the purpose of drawing a twenty-stamp mill. According to some of the old timers, the paper was describing the beginnings of the Monte Cristo Gold Mine . Around 1893, the property passed into the hands of a Colonel Baker. A company was organized and some $85,000 spent in building a rough wagon road from Acton up Aliso Canyon, over Mill Creek Summit, and down to the Monte Cristo Gold Mine. Heavy mining machinery was transported in and assembled, and buildings were erected. The first account of any extensive work in the Monte Cristo Gold Mine appeared in 1895. Development at that time included several 5-foot to 30-foot adits, and three shafts, 10 feet to 40 feet deep. The rock was crushed in a four-stamp mill with 600-pound stamps, and a 5-foot Huntington mill. Two of the above mentioned mines were free milling and two produced sulfide ore. Five men were engaged on the property at the time, mainly on development work. The owner in 1895 was R.E. Hudson. A few years later, J. J. Haish, owner of a store in Acton, grubstaked Captain Elbridge Fuller who, with a succession of partners, ruled the Monte Cristo Gold Mine for some 20 years of stormy personal controversy and marginal mining success. It seems that Fuller could never get along with his partners, and one by one they either sold out, were driven away, or met with foul play. Fuller entered another partnership with two brothers, Hudson by name, but seems to have taken into his confidence another party named Hutchinson. The latter quarreled with the Hudson's who threatened him and drove him off. Fuller and Hutchinson then turned against the Hudson's. On a trip to Los Angeles and Pasadena, they plotted to kill or drive the Hudson's from Monte Cristo Gold Mine . After a drinking spree, they arrived at the mouth of the Arroyo Seco where, finding themselves in need of more liquor to bolster their courage, they stopped while Fuller returned to the city to replenish the liquor supply. Upon returning to the Arroyo, he found Hutchinson dead, having his head blown off with a gun. A short while later, the Hudson’s withdrew from the partnership, leaving Fuller sole possessor of the Monte Cristo Gold Mine . In 1897, carefree as he was, he suddenly departed for the Yukon to join the Klondike Gold Rush. Upon his empty-handed return two years later, he induced a man by the name of Hauser to supply $1,500 in order to start work once again at the Monte Cristo Gold Mine. The property was then recorded in Hauser's name. When the money was expended, Fuller turned on his partner and went to Los Angeles to swear that the improvement work required by mining law had not been completed. Hauser therefore lost his lease, and the conniving Fuller once again "jumped" the claim to become sole owner. Fuller's last years at the Monte Cristo Gold Mine were trying ones. Mining proved unprofitable, so he bought a string of mules and did hauling work for his mountain neighbors, Captain Loomis on Alder Creek and Delos Colby in Coldwater Canyon. Around 1915, Fuller finally left for good. Fred W. Carlisle then "jumped" the claim, and remained in control of the Monte Cristo Gold Mine until his death in 1946. Carlisle had been assayer in the Randsburg Mining District, where he had reportedly suffered financial losses, and came to Mill Creek seeking to revive his expiring fortunes. Under Carlisle, the Monte Cristo Gold Mine reached the zenith of its activity - during the years from 1923 to 1928. Gold-bearing ore was recovered from two groups of quartz veins about a thousand feet apart, to tap these six tunnels were bored, two of them reaching back 425 feet into the Mountainside. New machinery, including a Blaker Crusher and a portable compressor, was laboriously hauled in. According to the California State Mine Bureau, a total yield of $70,000 was recovered from the Monte Cristo Gold Mine in 1927, its peak year. Old-timers, however, insist the figure was more like $200,000, and that the difference was stolen by "high graders." 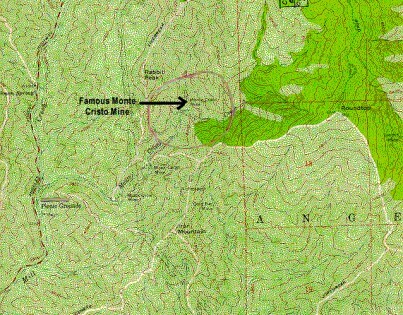 In 1927(l) the Monte Cristo Gold Mine property consisted of ten claims, The development work consisted of two adits and a shaft 133 feet deep. The upper adit was 275 feet long. Four ore shoots, ' 35 feet by 3 feet, were found and stoped to the surface with a reported recovery of $70,000. At that time gold was selling around $20 an ounce. The values on the lower adit were reported to be $10.00 per ton or 1/2 once of gold per ton. The equipment used at that time was a 6-inch by 12-inch Blake crusher and a 5-foot Huntington mill. In the late 1920's Mr. Carlisle installed a small roasting and cyanide plant to process the ore, but later the ore was shipped to Acton for processing. The Huntington mill was scrapped at this time.The owner in 1927 was Fred Carlisle. A portable compressor was in operation and five men were working. The west vein area, leased to W. 'W. Gilkey and Crouse L. Elgin, is situated 1200 feet west of the 17-Monte Cristo Gold Mine vein. The upper level on this vein consisted of an adit extending north 130 feet* At 40 feet a winze was sunk 30 feet and a small underhand stope, 16 feet by 21 feet, produced ore valued from $18.00 to $40.00 per ton. Fifty feet below, a crosscut was driven to the vein, and a drift along the vein extended north 50 feet. The last 15 feet showed a vein 4 feet to 6 feet aide with 3 feet of quartz and sulfides. In 1937 four men were employed in the lower tunnel. After that, the Monte Cristo Gold Mine reverted to its familiar pattern of promise followed by frustration. Several promising "pay streaks" were hit, only to fizzle out just as they appeared to spell "bonanza." Carlisle, hard-pressed to make ends meet, was obliged to suspend operations for several years at a time. During the mid-1930's, he leased the east and west veins to different operators, the first and only time the Monte Cristo Gold Mine was not worked as a single unit. From 1935 to 1942, the mine was worked only intermittently, and in the latter year it ceased operations from the old mill site, thus putting a period to more than half a century of excitement and dreams, and a mine that is rich in history and famous. In the 1940’s the Monte Cristo Gold Mine was sold to the family of the present owners. Today, the Monte Cristo Gold Mine is managed by its owners, Bob and Susana Kerstein. The Famous Monte Cristo Gold Mine is a testament to man's century-old quest for mineral wealth in the San Gabriels and his test to survival. In September 1979, the Monte Cristo Gold Mine area with hit by a tremendous fire that burnt hundreds of thousands of acres in the forest. Although the Monte Cristo Gold Mine area was destroyed, three of its main structures miraculously and mysteriously survived the fire. The Monte Cristo Gold Mine has had a history of major challenges, but is has always survived and always will. The Monte Cristo Gold Mine region in the Angeles National Forest of the San Gabriel Mountains has the Monte Cristo Campground and the Monte Cristo Ranger station operated by the United States Forestry. Although the campground is open to the public, the Monte Cristo Gold Mine is private property and not open to the general public. Over the years, the Monte Cristo Gold Mine has been victim to a lot of vandalism which is why it has a strict no trespassing policy. We have since taken the History and tradition of the Monte Cristo Gold Mine name and expanded into the Internet at with Monte Cristo Antiques of Falls Church. If the old-timers of the Monte Cristo Gold Mine could only see where their dreams have gone.....from hard rock lode mining in the San Gabriel Mountains to the Internet! Information for the Monte Cristo Gold Mine history was collected from a variety of sources including John W. Robinson, the famous writer and historian of the San Gabriel Mountains and a Geology report prepared by Rodney Phipps. Thanks to everyone for their help in putting together the history of the Monte Cristo Gold Mine. or a Private Secured location for filming Motion Pictures, Episodic TV or Commercials. Send email to bobk@bob.com. The property manager is Barry Baker.